Situated at the crossroads between the ancient Postojna and the way that goeth down from Valsugana, Pole since ancient citadel was critical. 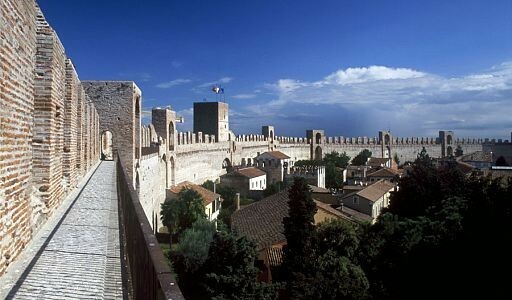 The wonderful city wall was built in the 1220 by the city of Padua to protect themselves from the threat of Treviso, that 20 years before had built became the center of a community, governed by its own statutes. 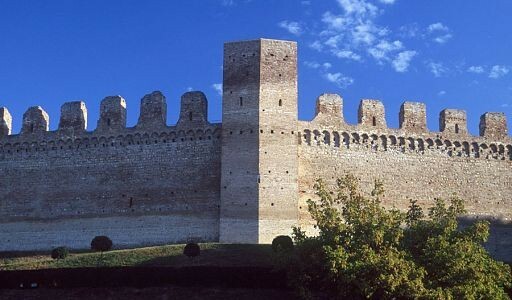 Impregnable fortress, resisted the attacks of the Ezzelini; but surrendered to the fall of Padua. Came under various rulers in the fourteenth century (Scaligers, Carraresi, Visconti, Malatesta), but in 1405 surrendered to Venice and maintained so the autonomy. Today it retains almost intact medieval walls elliptical, alte ben 12 meters, with four towers facing the cardinal points and a beautiful walkway in share. - Casa del Capitano (Period estivo: Monday and Wednesday to Friday – from 9,00 to 13,00 and by 14,00 to 18,00 – Saturday and Sunday from 9,00 to 12,30 and by 14,30 to 19,00 – Closed on Tuesdays. Winter time: Monday and Wednesday to Friday – from 9,00 to 13,00 and by 14,00 to 16,00 – Saturday and Sunday from 9,00 to 12,00 and by 13,30 to 17.00 – Closed on Tuesdays). - Walkway (Period estivo: Monday and Wednesday to Friday – from 9,00 to 13,00 and by 14,00 to 18,00 – Saturday and Sunday from 9,00 to 12,30 and by 14,30 to 19,00 – Closed on Tuesdays. Winter time: Monday and Wednesday to Friday – from 9,00 to 13,00 and by 14,00 to 16,00 – Saturday and Sunday from 9,00 to 12,00 and by 13,30 to 17.00 – Closed on Tuesdays). - Municipal Palace or Palazzo della Loggia (visited during the opening hours of the office – closed on Saturdays and Sundays. Porch always accessible). 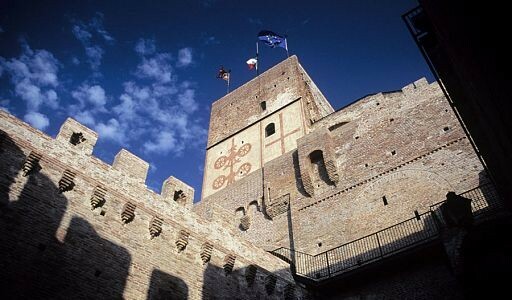 - Tower of Malta (Winter time: Saturday and Sunday 14,00 – 17,00. Period estivo: Saturday and Sunday 15,00 – 19,00 – After booking the IAT). - Villa Dogs of Scale, Malfatti, Rina (open to the outside and during the time of the Offices – Closed on Saturday and Sunday). - Teatro Sociale (Tuesday to Friday 10,00 – 12,00 by appointment). - Cathedral (open before and after the religious ceremonies). - Oratory of the Savior (Cà Nave) (open by appointment to the IAT). 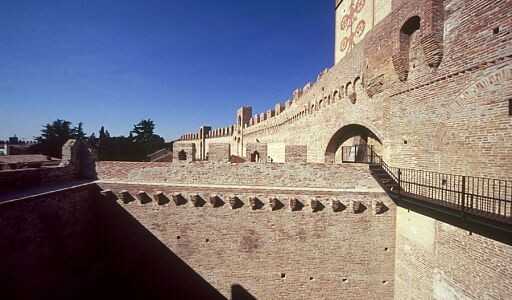 - Church of Santa Maria del Carmine (open before and after the religious ceremonies). - Church of St. Francis Convent (open before and after the religious ceremonies). - Church of the Holy Cross Bigolina (open before and after the religious ceremonies). - Pieve di San Donato (open before and after the religious ceremonies). - Church of St. Lucia (open by appointment to the IAT). - Cemetery Austro-Hungarian Empire (Winter time: 9,00 – 12,00 and 13,00 – 17,00. Period estivo: 9,00 – 12,00 and 14,00 – 18,00). - Voices of the Evo Middle – in September. - St. Joseph's Fair – the second half of March. - October Cittadellese – October. - Fiera Franca – 4First Sunday of October. - Carnival – Mardi Gras. - Flea market – 2° Domenico del mese. - Organic Market – 3° Domenico del mese. - Christmas Market – December. There are several routes that you can do; the input to each of the ports is indicated with appropriate signs. What is suggested is one among many. The tour begins Treviso Gate, Recently restaurata, which presents a partial demolition nineteenth; on it stands the tower top 25 meters. 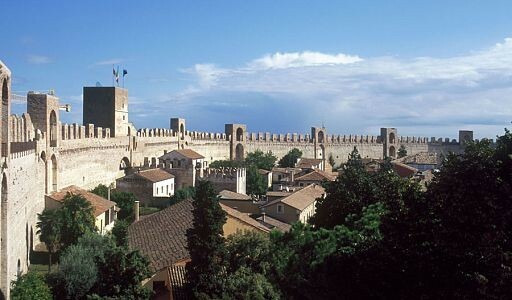 It then enters inside the walls, within the village, along Via Marconi where he faces the left side of the fifteenth century Praetorian Palace, former pawnshop, belonged to the lords of the Citadel Roberto Sanseverino and Pandolfo Malatesta. Continuing then to Via Marconi, a little further, is located on the right side and you can visit the Parish of Ss. Prosdocimus and Donato, building of the sixteenth century, today by the neo-classical style (paintings by Jacopo Bassano and Palma il Giovane within). 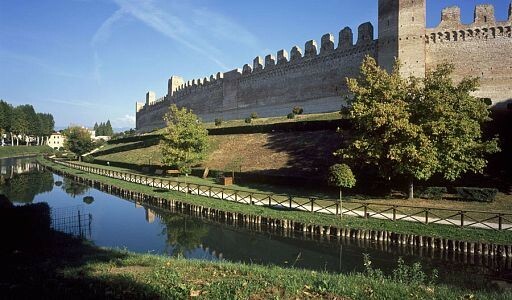 Then turn right and walk along Via Roma arrive at Porta Bassano, the “castle”, complex once isolated from the rest of the city by a moat that surrounded and dominated by the tower of 30 meters in height. Through a pointed arch doorway flanked by a postern, you go into the court of the guard protected the keep. Entered the courtyard towards the city, leads to a passage on the left at the Captain's House, fourteenth century building built in parallel to the walls. From here the panoramic promenade walkway of Ronda that currently you can walk both to the East and to the West. 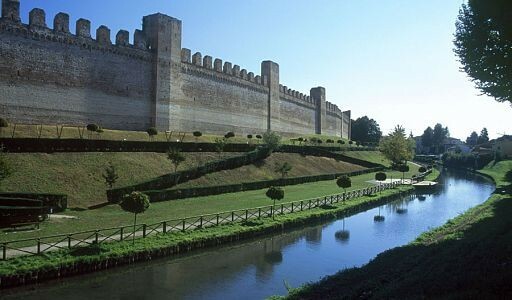 If you do not want along the walkway, emerged from the Captain's House turns to the right path and the bridge over the moat, turn left and walk along the stretch of road that leads from Porta a Porta Bassano Vicenza, admiring the walls on the left and the breach. 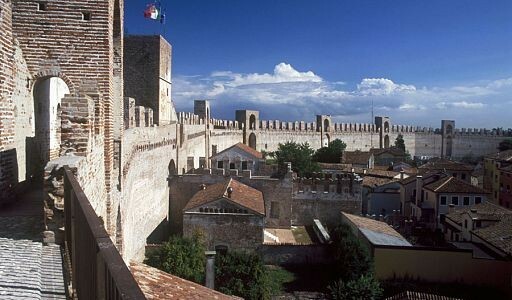 It falls to Port Vicenza with the size of the tower top 25 meters, in the middle of the Barbican, on the right, accessing public gardens lining the stretch of wall between Porta Porta Padova and Vicenza. 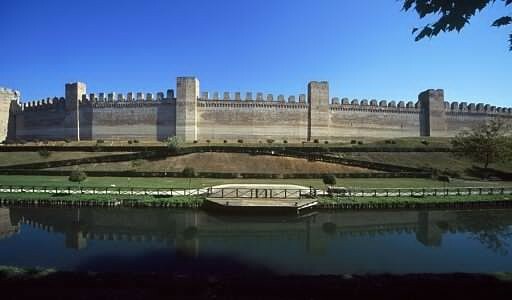 At the end of the walk you get to Porta Padova, once a drawbridge. On the domestic front is flanked the imposing Tower of Malta, now houses the Archaeological Museum and the arrival point of the walkway of Ronda, erected by Ezzelino III da Romano in 1251 to imprison opponents. On the left is the facade of the Church of Torresino, rebuilt in the eighteenth century, built by Padovani near the walls, with the proceeds from a bell tower. All is covered by up to Piazza Garibaldi where L.Pierobon, on the left side is the Municipal Palace or Palazzo della Loggia, Gothic-style building with a porch on the ground floor that houses are symbols of power and a lion of St. Mark Stone. Turn left and paths a few hundred meters away from Independence meets, on the left side, the Teatro Sociale of the second decade of the 1800, realized on a project of Bassano Joseph Bauto and edited by Giuseppe Jappelli. Returning to the Town Council Offices back down via Marconi and exited from Treviso brings you back to the parking lot of Villa Rina. For those wishing to admire the walls externally, you can go 3/4 its outer circumference in the stands where you can also park. Communities: Ca' Onorai, Facca, Laghi, Pozzetto, Santa Croce Bigolina, San Donato, Santa Maria.